Michael Scicolone Media is a new company with years of experience in photography, print ads and communication strategies. They were looking for a presence on the Internet where they can showcase some of the photographs and provide information about the services they perform. We worked within their parameters to create a stylish and professional website. We helped then secure a domain name and a hosting service and set everything up for them. We wish MS Media good luck in the future! At Close Range is a new distribution company that buys name brand retail items from insurance recovery, bankruptcies, excess inventories, and close outs and sells them through various venues. Unlike a retail store that sells one unit at a time, ACR sells in bulk. They quickly needed a logo, invoices, business cards for their sales team and a simple website that would show just their featured items for the month. At the time they approached us we were very busy but we found time to meet their deliverable dates 2 months prior to the holiday season. They have been slated for an e-commerce website for the middle of this year. One of our clients, Kleen Sweep, has been seeing a significant increase in business since they hired us. They wanted to continue to put a professional foot forward whenever they are with their clients. Since we have far exceeded their expectations and continue to deliver high-quality results for them. 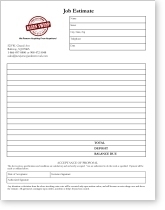 They asked us to create and have printed a 2-ply carbonless Job Estimates Form. We not only delivered but also came significantly under budget for this project because of our resources around the US where we were able to get an amazing low cost, high quality print that beat all local print shops in the area! Capt. Mike and Capt. 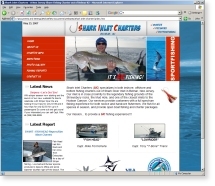 Tony from Shark Inlet Charters was looking for an exciting looking website for their new sportfishing charter. They were looking for some fresh new ideas meshed with their requirements for color, look and feel. They also needed a logo, which would help them brand the charter service. They also, came to us with a tag line that they wanted to incorporate in the site text and logo. They were a bit apprehensive giving us creative freedom to design their website but once they got the chance to review the graphic template their worries were set aside and they were “on board” for the build knowing their Internet image was in good hands. 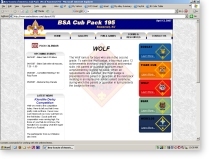 Cub Pack 195 from the Boy Scouts of America came to us asking us to donate some of our time to come up with a more exciting website for their pack. Their current site, at the time, was hosted on geocities and looked very amateurish and lacked functionality. We sat with the den leader to work out all the pieces they wanted from their new site to help improve their communications with the parents and members. We came up with a concept that would reuse some of their work they created for a recruitment brochure. They loved the idea and the design! 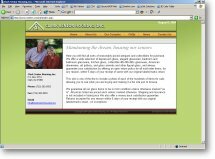 We also helped them secure a hosting service. As out time permits we will continue to improve upon the site's features. Evening Tide Charters has been around for years but now wanted to compete with some of the sports fishing charters that have a presence out in the Internet. 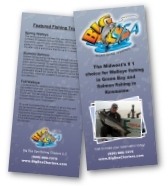 They came to us because they have seen our work on many of the NJ fishing websites and thought we could really help them make a “splash” in the market. After speaking with us they knew their new Internet image was in good hands. We came up with their logo during the development of their website and we have plotted a marketing strategy that will be executed in the upcoming weeks and throughout the fishing season that fits their budget. With the 2007 fishing season just starting, Capt. 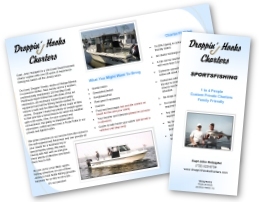 John of Droppin’ Hooks Charters needed it updated and was thinking about a new look for his brochure. We spoke to him about our print services and what we can offer. He was already impressed with the work we have done and asked us to come up with the new brochure. With some guidelines we developed the brochure borrowing some design ideas from the website to closely brand the two mediums together. Needless to say, Capt John was very happy with the work! 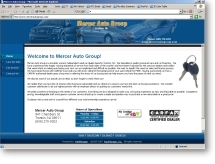 Mercer Auto Group recently bought a website package from AutoManager, Inc using their product called WebManager to help them inventory and display their pre-owned vehicles online. They needed someone to figure out how to make the site more appealing while working within the limitations of the website software package. After our initial discussion with the owner to discuss content, pages and affiliations we worked with the software to customize the site to meet their needs. So not only can we help create a customized website for you but we can work with you to help customize your prepackaged website to help you save money! Some of our clients have asked us to create advertising banners and buttons to be used on directory websites and affiliates websites. We create our banners in Macromedia Flash or as animated GIF images or as JPG images. One of our clients liked their Flash banner so much that they asked us to create a Gift Certificate for them based on it. The gift certificate was created for commercial grade (300 dpi), like all our print media products we produce for our clients. We can either help them to print the out the piece themselves if they only want a few of them or we can take care of the printing for them if a large lot is needed! Kleen Sweep is a junk and debris removal service that will also buy and help sell entire estates but they needed help with corporate identify/branding. They wanted a logo and some marketing that would standout and something that made you feel like a job well done! So we created their logo and provided them with a new business card layout, which is cleaner and easier to read than their previous ones. We also provided them with a brochure insert which they will provide to various other businesses and residential areas to help increase business. 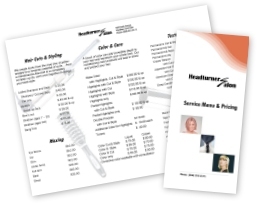 We provided all the text on both the brochure insert and the business card as part of our service! We also built an entire calendar scheduling program that will help them organize when bulk pick-ups are scheduled for various towns. 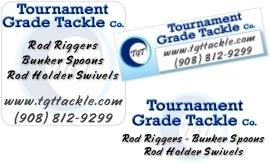 Tournament Grade Tackle Co. is one of our maintenance plan customers. They liked the work that we had been providing them and asked if we could help their sales team with a tri-fold product brochure. 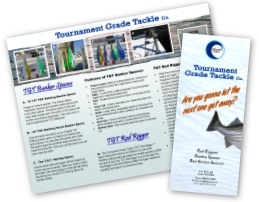 The brochure had to be useful for both retail outlet owners and consumers when they appear at fishing trade shows. We gave the brochure the same look and feel of their website and all their internet advertising banners we created for them. We also came up with the tag line “Are you gonna let the next one get away?” and the concept of a striper bass leaving the area. The sales team and the owner was very pleased with the work. 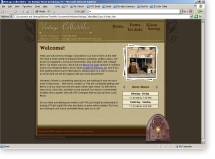 Vintage Collectibles is an antique store in Rahway, NJ. They first approached us to help them sell some of their items on eBay. Soon they realized as all our clients do… our work is far superior than others and asked us to do some additional work for them. 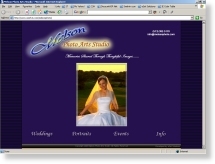 They wanted a web presence to help drive business to the store and to help advertise their more expensive antiques. They needed a new business card layout to help advertise their website’s address. We have done quite a bit more business with them. Everything from PC support, eBay auction templates to coming up with new business ideas. 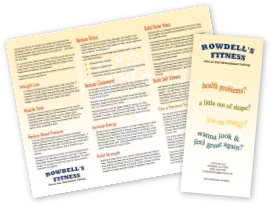 Rowdell asked us to create a brochure for him that would list the benefits of working out and provide detail information on how each benefit is gained. 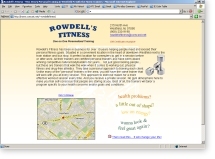 Then tie in how a personal trainer could help achieve those benefits and personal goals and then describe Rowdell’s Fitness and how their trainers are better suited. We researched all the information out and wrote all the content for the brochure. We then designed the brochure to ensure we didn’t alienate any group of potential clients. We also had the brochures printed, folded and delivered for much less than anyone else. Mr Petterway was extremely happy with the results. We also setup an email account for him, configured desktop settings for him to pull mail from that account. 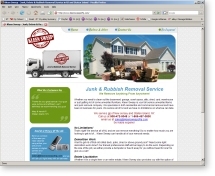 We also provided him with a simple 1 page website that gave the look and feel of the brochure. 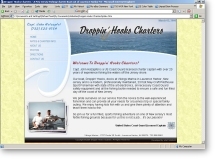 Dr. Keri Ingrassia-Squiers came to us needing a simple and professional website. 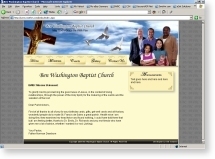 Her husband liked some of the websites we have displayed on this examples page. 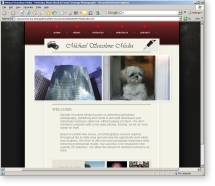 He also wanted a web development company that could also be there for them if they wanted to expand the website out. We worked with Steve to create a website that utilized specific colors of the doctor’s office and business cards. We also submitted the site to over 25 search engines and configured the email account and the web server to meet their needs. 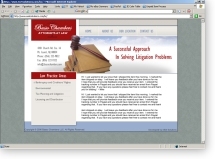 Basso & Chambers is a fairly new law firm and they needed to get their name out there. They hired us to create a professional website that would provide their clients information about their firm as well as some legal advice. We are also worked with them to create print brochures and business cards along with a logo for the firm. We were contacted Headturner Salon located in Westfield, NJ to help them create a simple but professional website. They needed us to recreate a soft copy of their logo. Over the years they lost their original copy. We also reformatted their Job Application to give it a more professional look and then converted their Job Application and Pricing Menu to PDF format – a more widely used document format on the Internet. As we do for all our clients we worked on getting them listed in all the major search engines and help them with their Internet marketing. During the development of their website they expressed interest in having us build a tri-fold price list for them that would have the same look and feel as their website. We completed the price list which they have displayed at the store’s register. Captain John Holzapfel was getting ready to launch his new charter business but he needed an internet presences. 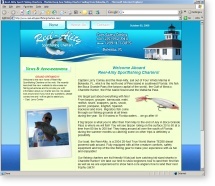 He found that more and more fishing charters were advertising on the web and he needed help making his business competitive. He was looking for a web design company that could provide him a personal touch to find a hosting service, register a domain name, set up email accounts, design and build a website and maintain it for him. We recreated his logo and got him listed on all the major search engines as well as helped him with advertising his company to get the word out. Clark Senior Housing approached us with a need to communicate information about their new senior housing project in their town. The development for this project was developed in ASP.NET with an MS Access database. The site also contains an administration panel which will allow them to easily update the content in the site without any knowledge of website development. After many years of being a collector, Glenn Hasbrouck wanted to start organizing his collections with a website. We met with Glenn and came up with the design. All development was done in ASP.NET with an MS Access database. All content in the system is table driven which provides Glenn the flexibility to grow as a collector. Once development was complete we created an 11 page User Guide to assist him in using his new site. Asked us to help them with digitizing an address list they requested from their town's municipal building. The list was a printed 22 page document of registered dog owners. We scanned in those pages using an optical character reader. Then we created a program that read in those pages and performed some various clean-ups. For the few cases where the program couldn't clean up we manually fixed in the file. Lastly, we created 2 types of mail merge templates in Microsoft Word as well as a manual on how to use them. They also asked us to create a 1 page concept website using one of our templates.